The value of pipe #463 is n/a points. 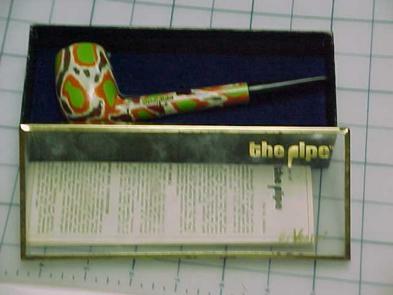 When I saw this pipe offered by Tina Cook on eBay, I somehow thought it was a Billiard, which would have completed the California Style Row with New-in-the-box pipes. Imagine my disappointment when I discovered it was "just another Canadian." Now I will have to put this entirely too expensive pipe on the Pipes for Trade page and hope to trade it for one more useful to the collection. An old friend to whom I am much indebted for his help in building my collection and researching A History of the pipe and developing some sense of the chronology of colors was pleased when I offered to give it to him. The credit side of the ledger is still in his favor, but I feel better about having, in this small way, repaid him for all he has done for me.